Vourneen Ryan began her studies with Doris Keogh at the Royal Irish Academy of Music. In 1995, Vourneen was awarded a scholarship to the Guildhall School of Music and Drama, where she studied under Edward Beckett, Philippa Davies, Sarah Newbold and Paul Edmund-Davies. 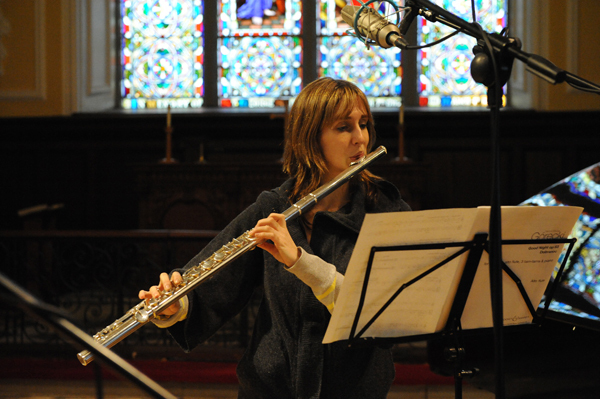 Vourneen held the position of sub-principal flute with the Royal Liverpool Philharmonic Orchestra from 2004-2007 and now freelances regularly with the Scottish Chamber Orchestra, BBC Scottish Symphony Orchestra, BBC Philharmonic, RTE Concert Orchestra, Ulster Orchestra, RTE Symphony Orchestra,Northern Sinfonia, Opera Theatre Company and the Scottish Ballet. Vourneen has given many recitals at home and abroad including chamber music recitals with Merchant Winds quintet, Fusion wind quintet, Gael Winds and the Oriel trio. She recently performed on the critically acclaimed Louth Contemporary Music Society’s CD’s “A Place Between” and “Path”. Along with her performing career, Vourneen has recently been involved in setting up a Career and Enterprise skills programme for students at the Royal Scottish Academy of Music and Drama. Vourneen is a recipient of Countess of Munster, Hattori Foundation and Arts Council of Ireland bursaries.